Dr. Pendleberry’s methods of diagnosis are based on the Chinese, Japanese, Korean, American, and German principals of Chinese Medicine and it’s integration with Western Medicine. His method of treatment is to establish a balance of the human ecosystem in order to correct the imbalances that are causing the “disease”. This is accomplished through the stimulation of Acupuncture points by needles, massage therapy, electricity, heat, cupping, magnets, and cold laser/LED light therapy; along with the use of Chinese Herbs, Essential Oils, Diet Therapy, Lifestyle Changes, Food, and Nutritional supplements. He treats many different diseases and disorders from the newborn to the elderly. 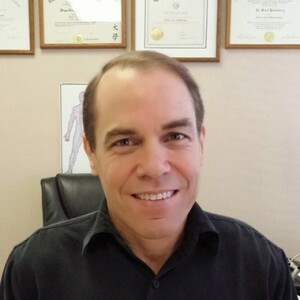 Dr. Pendleberry is a General Practitioner, and has practiced in the Thousand Oaks, Westlake, Agoura, Simi Valley, Moorpark area since 1987, and has lived in the Conejo Valley since 1963. During succeeding years, Dr. Pendleberry has continued to attend seminars in advanced Acupuncture techniques, Chinese Herbal Medicine, Advanced Pulse Taking Techniques, Sports Medicine, Oriental Diet and Nutrition, Essential Oils, Hand Acupuncture/Magnet therapy, Ear Acupuncture, Cupping therapy, and Microcurrent therapy to expand his knowledge and practice of Oriental Medicine and it’s complements. 1985: Bachelor of Science in Environmental and Occupational Health at California State University of Northridge. 1988: Doctor of Oriental Medicine (O.M.D.) degree from South Baylo University of Oriental Medicine. 1987: Passed the California State Examination for Licensed Acupuncturist, and has practiced Oriental Medicine professionally in the Thousand Oaks and Westlake Village area since. We are located on a small quiet cul-de-sac off Thousand Oaks Blvd between the Westlake Blvd and Hampshire exits. Our office is conveniently located on the bottom floor immediately to the right when you walk through the double doors. Lauren is our main receptionist in the office along with GG, Tina, and Raquel. The office is informal and comfortable with an open format with the staff and patients. Once you come into my office or treatment rooms it will still be informal and comfortable but also private. My goal is for you to feel comfortable before, during and after treatment. You should have an understanding of my treatments and goals for the condition(s) you came in for and in the end increased knowledge and understanding of yourself and how to improve upon your own imbalances that created the condition(s) you are being treated for.